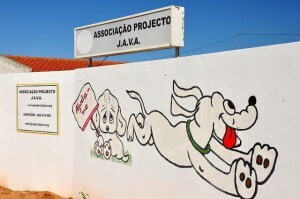 The Shelter of the Association is located in Lourinhã and is located in the local area, assigned to JAVA. It currently has 49 boxes, each of them with a number of dogs that varies according to their dimensions. In our Shelter we separate the adult dogs from the younger ones and babies. Males are separated from females not yet sterilized in order to prevent litters from spreading! Birth control is one of the main means of combating neglect and maltreatment. The sterilization of dogs and the castration of dogs are other methods that we advocate for a better quality of life, allowing an effective control of the population. Ask us how to sterilize your female dog or your street one. Avoid unwanted litters! We also have storage area for dry food, collection of various products such as medicines and other accessories or cleaning utensils. Besides the boxes, our animals have a patio where they can run and play. In the container, we have a small health clinic for our animals, witch also works as a support office, in face of the need to organize all the Shelter paperwork. We invite you to visit us. A hostel in an association is not necessarily a desolate and unconditional place (see the photos here). And the JAVA Project Association is proof! Our Shelter hours are from 9:30 a.m. to 12:30 p.m. every day including Saturdays, Sundays and holidays. Here our dogs do not have a sad look. We believe that we have good conditions, that we want to improve them, and with your help this will be a very close reality! Come visit us! Your support will be our bonus! See more photos, know our location and also our contacts.